Elegant and simple to prepare. Nothing can set a mood for romance like a fine home cooked intimate meal for two. This Valentine's day, I wanted to give my sweetie a few of her favorites, beef tenderloin, sweet potatoes and asparagus. I wanted to make it a little different by adding some Texas flair, yet keep it simple enough to allow time to concentrate on other aspects of the evening. We start our special meal with a simple and elegant salad of mixed greens with strips of jicama and fresh avocado, dressed with cilantro-lime vinaigrette and garnished with crusty pepper jack cheese croutons. For the main course we have a marinated seared beef tenderloin filet with a roasted shallot and port wine sauce accompanied by savory chipotle sweet potatoes and asparagus roasted with garlic and olive oil. While this meal may sound a little bit complicated by description, it is elegant and simple to prepare. The menu is designed to have complimenting and contrasting flavors with unexpected twists. The potatoes are surprisingly savory in a world where sweet potatoes are expected to be "sweet." The chipotle pepper does not add much discernable heat but it does add a wonderful slightly smoky and tangy flavor to the potatoes. 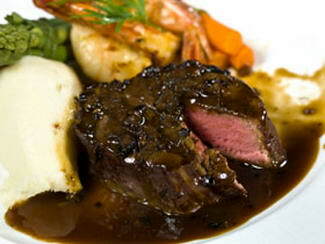 The beef tenderloin and the accompanying sauce add the sweetness for the dish. The asparagus has the slight crunchy texture and accompanies the other items while adding a contrast in color. Finish this meal with your sweetie's favorite desert, and you are in business! Just don't be surprised by the effect a meal this good can have on someone. I hereby relieve myself of all responsibility, intended or implied, related to the results caused by serving such a meal to a significant other. If you cook this, you are on your own! Any good lawyers out there? Place the cilantro and lime juice in a blender, blend until smooth. Using the hole in the top of the blender or food processor, slowly add the oil to create an emulsion. Season with salt and pepper to taste. .
Find a good loaf of bread that you want to serve with the main course of this meal. I go for a nice crusty baguette, but this can be done with any bread that you can slice. From the baguette, slice about 6-8 slices about ¼ inch thick. Arrange these on a baking sheet. Drizzle with a little bit of olive oil, and sprinkle with a little bit of salt and pepper. Place a thin slice of pepper-jack cheese on each crouton. Bake at 350degF until the cheese is melted, and the bread is crisp and toasted. Enough mixed greens for 2 salads. Buy it already washed and ready to eat to keep it easy to prepare. Jicama is a root vegetable that looks like a.. well.. hmm.. It looks like jicama! It's brown on the outside, about the size of a grapefruit. Its almost round. It's very firm. The flesh is very white, very crisp, almost neutral in flavor. If you can't find jicama, don't worry about it. You could always use tomatoes. Peel the jicama. I find it easy to use a paring knife instead of a peeler. Slice a few ¼ inch disks and then cut into very thin strips. Halve the avocado, remove from the skin with a large spoon and slice into strips lengthwise. In a large bowl, toss the salad greens with enough dressing to coat. Plate the salad. Arrange the avocado in a wagon wheel pattern around the salad. In the same bowl, add the jicama strips and a little dressing. Toss to coat. Place a small pile of the jicama strips on top and in the center of the salad. You can garnish with a little diced tomato or shredded carrot for color if you like. Place some of the pepper-jack cheese croutons around the rim of the plate. That's it! 2 sweet potatoes, peeled and cut into about 3-4 pieces. Boil the peeled and cut sweet potatoes until tender. Drain well and return to the pot with the heat on low. Allow any remaining moisture to evaporate in the warm pot. Add the remaining ingredients and mash with a potato masher. If the potatoes are too stiff, add a little more sour cream or some milk. Season to taste with salt and pepper. Cover and set aside in a warm place on the stove. They will stay hot for a while. Have your favorite butcher cut two nice 8oz tenderloin filets for you. The day before the meal, make this marinade by mixing the above ingredients with a whisk. Place in a zipper bag with your steaks. Coat all sides of the meat. Place in the refrigerator overnight. Roasted Shallot Port Wine Sauce - Make ahead of time. 2 whole shallots, cut in half, tough outer peel and root ends removed, coated with a little olive oil. Roast in a hot oven (450-500 °F) until deep golden brown and soft, almost burned. Allow to cool. You can find demi glace at gourmet food stores and in many supermarkets. Demi glace is a reduced fortified brown veal stock with an amazing depth of flavor. It will be near other broths or stocks. The best ones are in the freezer section. If necessary, substitute with beef stock or beef consume. In a sauce pot, combine all the ingredients. Bring to a simmer and reduce in volume by half. Depending on the strength of the demi glace, add the corn starch mixture a little at a time mixing well and allowing the sauce to return to a simmer before adding more. You want to achieve a consistency that will coat the back of a spoon Season with salt and pepper to taste. Cover and set aside or refrigerate overnight. Preheat the oven at 500°F. Heat a cast iron or oven proof pan over medium high heat until very hot. Place the steaks in the hot pan and sear until a nice crust forms. You will get a lot of smoke from doing this so make sure your vent is on. When the bottom of the steak is nice and brown and crusty, turn it over and place the entire pan into the hot oven. Cook to desired doneness. For medium it will take about 10-15 minutes depending on the cut of the steak. When the steak is done, remove from the hot pan and allow it to rest at room temperature while you cook the asparagus and reheat your sauce. This will allow the hot juices to redistribute through the steak and finish the cooking process. This is step is very important, and often overlooked in restaurants where time is not on the side of the cooks. You will notice the difference. You don't want your steak cold, so don't let it rest too long. Trim the ends of 1 bunch of asparagus and place in a bowl. Mince 1 clove of garlic very fine. Smash the garlic with the side of a large chef knife or cleaver into the cutting board and mince fine. You don't want to see big chunks of garlic in this. Drizzle the asparagus with a few tablespoons of olive oil and toss with the minced garlic. Sprinkle lightly with salt and pepper. Arrange in one layer on a baking sheet. This can and should be done ahead up to this point. When the steak is cooked and out of the oven, the asparagus goes into the hot 500 °F oven immediately. Roast until tender-crisp, about 5 minutes. So, there you have it, an easy meal with a complex feel. Below I will give a cooking sequence for timing purposes to let you see just how quick this will go when you cook. Peel and cut the sweet potatoes, place them in the pot with the water - ready to cook. Place the steak pan on the stove dry with LOW heat. Turn off the oven and the stove!